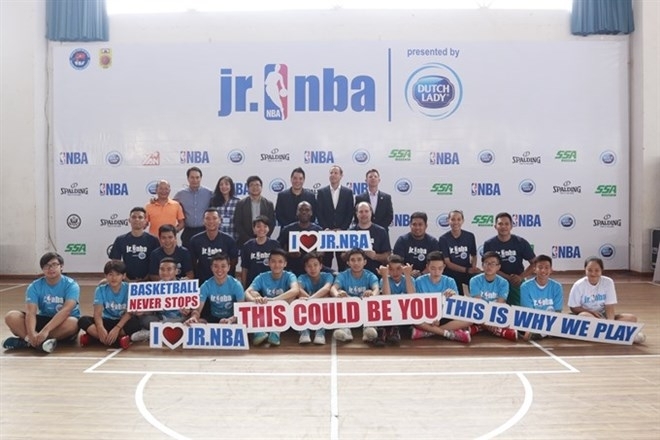 Jr. NBA, the US National Basketball Association (NBA)’s global development programme for youth basketball players, coaches and league administrators, has returned to Vietnam for a fourth consecutive year. The programme helps encourage children develop healthful lifestyles and nutrition. It will last until June, opening in HCM City and then going to Hanoi. This year for the first time it will also go to the central city of Da Nang. It is expected to attract 5,000 children aged 10 to 14 from 200 schools in the three cities. Moreover, basketball coaches will have the opportunity to take part in free coaching clinics and win Coach of the Year awards. The programme began on March 4 with a clinic for coaches and players at Ho Xuan Huong Stadium in HCM City’s District 3. There will also be many activities at schools. A camp to select 32 players will be organised in HCM City and Hanoi from March 17, and they will take part in the Jr. NBA national coaching camp in HCM City from June 23 to 25. Current and past NBA players will join the camp as part of the NBA Cares, the league’s global social responsibility programme that builds on the NBA’s mission of addressing important social issues. The programme will choose 16 players for a Jr. NBA Vietnam All-Star Team and provide them overseas coaching with other All-Stars from Southeast Asia at the end of this year. They will be coached in basic basketball skills and taught about the important role of nutrition as well as sportsmanship, teamwork and respect. Francesco Suarez, NBA Asia’s vice president for global marketing partnerships, said basketball has become popular since the programme was organised for the first time in Vietnam in 2014. Teaching young children basketball helps improve their health and wellness, he added. According to a Southeast Asian Nutrition Survey by Dutch dairy firm Friesland Campina in 2009, done in Indonesia, Malaysia, Thailand, and Vietnam, more than one out of five children in Vietnam had little physical activity and drank less than 180ml of milk a day. The survey also found that these children faced a 2.6 times higher risk of obesity than those who involved in physical activities and drank 180ml of milk a day. Dutch Lady, one of Royal FrieslandCampina’s brands, is the presenting partner of Jr. NBA Vietnam.